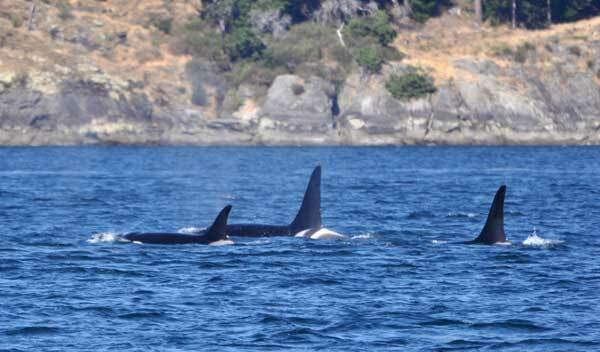 The big news in the whale world this week is that K-Pod came back into town on July 26th. 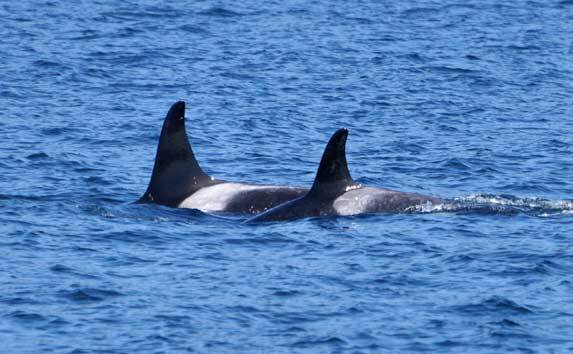 They had only been seen in the inland waters once briefly so far this summer season, so we haven't had any full-fledged superpods (where all members of the Southern Resident Community are present) yet this season. 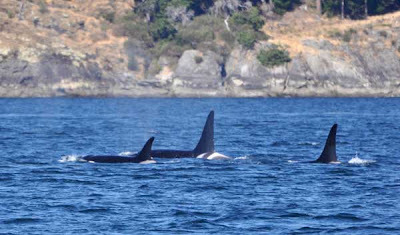 As I've written before, the whales have been mixing and mingling into all sorts of unpredictable groups this summer, and today was no exception. We didn't see all the Southern Residents in once place, but we did have members of all three pods traveling together in Swanson Channel! What's this called, a partial superpod? 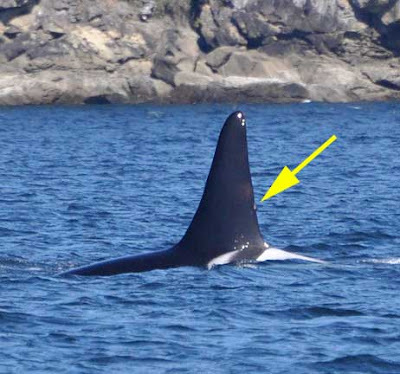 K21 Cappuccino acquired a new notch on his dorsal fin since we last saw him, as indicated by the arrow below. People often ask how the whales get nicks and notches in their fins and the answer is we just don't know for sure. For the marine mammal feeding transient whales some of their wounds are surely inflicted by their prey (like Steller sea lions) that have big teeth and are apt to fight back, but for the fish-eating resident whales it's more of a mystery. Did they scrape on something, or get entangled in something? Occasionally the injuries look like they may be inflicted by other whales because sometimes there are teeth rake marks alongside the nick, but we never really witness full-out aggression between killer whales. So, Cappuccino, what have you been up to? ?